The March challenge for the Island Batik Ambassadors was “Vintage Reimagined.” We were asked to design a project inspired by a vintage quilt. The quilt I chose as inspiration is a top pieced decades ago by Tilda Adamson, the grandmother of my friend Art Adamson. This Depression-era quilt features the Churn Dash or Monkey Wrench block, and has several interesting elements going for it. I like the way the on-point rows are staggered, and I find those blocks with the green background that fades into the green sashing very intriguing. But what really caught my attention, and served as my design inspiration, was that one pink-on-brown block on the right edge of the quilt (and in the inset). The way the pink churn dash is pushed off to the corner of the block reminded me of a story I heard in the late 1980s, when I helped a local museum with an oral history project leading up to the Montana statehood centennial. For my project, I used the Island Batik “Twilight Chic” collection. I had a stack of 40 10″ squares, plus 2 yards each of a dark blue and wheat-gold coordinate, all supplied by Island Batik. The story I had heard was that of four sisters who homesteaded about 25 miles from where I live, in north central Montana. To deter speculators, the government required each homesteader to build a house on their land, and they could not be away from their property for more than a couple of weeks at a stretch. The homesteaders’ dream became a nightmare for many, as they dealt with harsh winters, droughts, prairie fires, and a host of other dangers. For the sake of companionship and safety, the four sisters built their cabins in the corners of their homesteads, where their property met. Thus, they could all stay together at night, moving from cabin to cabin every few days, so none of them was absent from her property for more than the allowed time. The fabrics used in my 4-Sisters quilt were supplied by Island Batik. I used Heirloom­­ batting supplied by Hobbs, and Aurifil threads for piecing and quilting. Several years ago, an online quilters group I belong to got into a discussion about other activities we enjoy. Cooking, travel, writing and photography were mentioned quite often, but it turned out nearly all of us had two things in common – we have pets (mostly cats and/or dogs), and we are avid readers. Most of us also had a sizable library of quilting books. My own collection began with one of the few quilting books available when I made my first quilt in 1973, Ruby McKim’s 101 Patchwork Quilt Patterns. Rotary cutters hadn’t been invented yet, so every one of the 1755 (but who’s counting) 2.5″ squares in my 9-Patch quilt was traced with a pencil around a cardboard template and cut with scissors. Of course, the template’s edges got a bit “softer” with each tracing, so perfectly matching seams were a dream, not a realistic goal. It wouldn’t have won any prizes, but it kept me warm, and that was the point, and I was hooked. Soon after I began quilting, I discovered Amish quilts, and bought a couple of books about the quilts made in Pennsylvania. I’ve always loved bold graphic designs, and my father’s family is Mennonite, so it was probably a natural attraction. One thing that struck me was that – contrary to the “rule” that Amish quilts must be mostly black or dark and “cool” colors – most of the quilts in this book have very little black. And bright? There were some of the most over-the-top color combinations I had ever seen. I loved it! Colors that weren’t acceptable for clothing could be used in quilts. Here, my “Dust off a Quilt Book” blog hop post segues into my “Magnificent Mini” challenge blog post for Island Batik fabric, Aurifil threads and Hobbs batting. They supplied the materials for this project. I had quite a bit of fabric left over from my 2018 “stash” of Island Batik Fabrics, including this stack of 10″ squares from the Lavendula collection. I chose a navy blue from the “foundations” collection to go with it. I decided my center would be 9″ x 9″ (finished size), and the individual squares would be 1″ finished. My borders would finish 3″ wide. I needed five colors for the center of my quilt, so I chose five of the more “solid” color squares, and cut four 1.5″ x 10″ strips from each square. so I could lay out the squares in the order the strips should be sewn. Next, I had to make five strip sets, each with four strips, and rotating the colors properly. To help keep things in order, I cut a square from each of the scraps and numbered them. I laid out the squares in order for each stripset. Then I cut four 1.5″ segments from each stripset. I decided I wanted my largest diamond to be the lavender, so I set two of those strips aside, and began building two halves, working from the center strip out, adding matching strip to each side as I went. This rotation meant the center square would be white, so I cut a 1.5″ x 1.5″ square, and sewed it to the turquoise ends of the two remaining strip. This became the middle row of my centerpiece. I chose two matching purple and blue mottled squares for the border, and cut two 3.5″ x 9.5″ strips from each square. If I recall, I had a half yard of the navy blue. I cut two 2.25″ x 44″ strips for the binding, four 3.5″ squares for the corners and pieced a 16″ x 16″ square from the remainder for the backing. With the borders in place, it was time to layer this mini up with a bit of Hobbs Heirloom 80/20 batting and figure out how to quilt it. My collection of Aurifil threads is still pretty limited…but growing. These were my best choices for this project. I decided the white would be too stark, while the icy blue would show up, but not overpower the fabric. First, I decided to emphasize the squares in the center by quilting concentric squares. I used the inside edge of the toe of my 1/4″ foot to space my quilting lines about 1/8″ from my seam lines. I came up with this simple little Celtic style detail to dress up the corners just a bit. Add a binding, and a title “Across the Pond”, and this little quilt celebrates the journey of two of my Quaker ancestors, Thomas Stackhouse and Grace Heaton, who arrived in Philadelphia aboard The Lamb. In 2001, I got to spend a day in the towns of Settle and Giggleswick, Yorkshire, UK. It felt like a homecoming of sorts, to walk on streets that they may have known centuries ago. Thanks to Bea for thinking up and hosting the “Dust Off a Quilt Book” Blog Hop! I can’t wait to see what the other bloggers have found on their bookshelves. Many of them, like Bea and I, are also Island Batik Ambassadors! My first year as an Ambassador for Island Batik fabrics wrapped last Friday with the posting of my “Many Glacier” quilt, made for the “Icicle” collection, which should be in your local quilt shop about now. When I signed up for the program, I had no idea what to expect, but wave the promise of two shipments of Island Batik fabrics, and a selection of Hobbs battings, and spools and spools of Aurifil threads at me, and I’m IN! What’s more, I’m staying in for 2019. Color me HAPPY. There are more than 4 dozen Ambassadors this year, and our 2019 “tour of duty” began a couple of weeks ago, when we each received TWO big boxes via FedEx. These packages contain a brand new collection of Island Batik Fabrics that will be introduced that will be introduced to shop owners at Quilt Market this spring. This is a beautiful Rayon batik scarf! Island Batik’s popular Batik Sold – 3 yards each of white, gray and black. 5 yards of a lovely pastel pink neutral. This is from Island Batik’s Basic collection. This will be my biggest challenge. It’s 2 yards of a tiger stripe rayon batik. Ideas welcome! A Stack (42 10″ squares) of Twilight Chic, plus two coordinates. Watch for this collection in my March project. Hobbs Thermore batting. It’s a super-thin bonded and fusible batting made for use in quilted clothing. It works nicely in table runners and placemats, too. I’m a scrap quilter, so I L-O-V-E these. Island Batik calls them Stash Builders. each package has twenty 5″ x 22″ strips. More Hobbs batting. This one is Tuscany – a silk blend. 60″ x 60″. 8 cuts from Island Batik’s “Blenders” collection. We can use these in any project. Between you and me, this would have made me perfectly happy for the better part of the year. But wait…I said there were TWO boxes. I can’t tell you how excited the 2019 Ambassadors were to learn that we have a new sponsor – AccuQuilt. I’ll admit, a did a little schoolgirl hopping and squealing. I’ve been a fan of AccuQuilt from the beginning. In fact, I used the first royalty check from my book, The Thrifty Quilter: Make (Nearly) Free Quilts from Leftover Fabric (2010 Quiltwoman.com) to buy my first AccuQuilt GO!. I didn’t even know about AccuQuilt when I wrote the book, which describes my simple system for cutting up the scraps (anything smaller than a quarter-yard) from my quilting projects into custom pre-cuts, and 80 blocks that can be made in two sizes each from those pre-cuts. As it happened, my publisher heard about AccuQuilt as we were going to press, so she contacted the company, and it turned out they have dies that match the six shapes in my system. So, they added a “GO! Compatible” label to the cover, and have offered it on their website ever since. We have one AccuQuilt-themed challenge on our schedule for this year, but I can promise you’ll see a lot more GO!-compatible projects. My fellow Ambassadors are opening their boxes now, too. Visit their blogs to see the goodies they got. We’ll be posting our first projects for 2019 soon, too. Our theme is “Magnificent Mini Quilts”. Mine will be up on February 18, the first day of the Dust Off an Old Book Blog Hop, being organized by one of the Island Batik Ambassadors. Mine is one of the first quilt books I ever bought. I think you’ll enjoy it. I should have guessed that a year that began on a Monday, at -32°f, to boot, would go sideways on me, and boy howdy, did it ever. Still, I managed to produce a few more blog posts than I did in 2017…which isn’t saying much, to be honest. But this is already my second post for 2019, so things are looking up! Once again, I am taking part in the “Best of the Year” link party, sponsored by Meadow Mist Designs. Seriously, you’ll want to check out what the other bloggers have been up to! So, when I looked back over the “Seams Like a Plan” blog posts for 2018, it was fairly easy to pick my five favorites. Four of them deal with projects I produced for the Island Batiks Ambassadors program. Imagine this…twice a year a big (about 20 pounds!) box filled with Island Batiks fabrics, Aurifil thread and Hobbs battings arrives on your porch, and all they ask is that you make stuff with it! Who wouldn’t want to be a part of that? A Wee Little Quilt – In February, the Ambassadors challenge was to make a miniature quilt. It’s not something I do very often, but it is a lot of fun now and again. Am I There Yet? – In March we were asked to try a new-to-me technique. I thought an improvisational quilt would be simple. I was wrong…but in a good way. Safari Sampler – In August, I had a complete line of Island Batik’s Safari collection, and was challenged to use as many of the fabrics in the line as possible. I produced a sampler, and managed to use all of the fabrics. (This post has a free pattern you can download. Controlling the Chaos – My friend Vina was having trouble making a “random” quilt block, so I simplified it for her, and added the pattern to my “Thrifty Quilter” scrap block collection. So those are my favorite blog posts for 2018. Feel free to mosey through the archives and read the rest as well. As for me, it’s on to 2019, and I have a few quilty things on my calendar already. I have a few patterns that will be published in various magazines this year, and am going home in a minute to put the finishing touches on another proposal. I have one more quilt to make for Island Batik, and am waiting to hear if I get to continue with the Ambassadors program for another year. And, I have a couple of ideas simmering for the Moda Bake Shop blog. That and a full-time job should keep me busy. PS: Remember, if you click the “Follow” button on this blog post, you’ll get an email each time I publish a new post. Our final Island Batik Ambassadors challenge for the 2018 calendar year was to make a project that is whimsical and/or wonky. Well, it’s been that kind of year, so wonky it is. That and the fact that I have this Wonky Log Cabin tool from Quilt in a Day that I have been dying to play with! There are three patterns available, and I chose to try the one that comes with the ruler. It’s the closest to a traditional Log Cabin block. Before I continue, a word from our sponsors: All fabrics used in this quilt top are supplied by Island Batik, the thread is a 40wt 100% cotton from Aurifil, and while the top hasn’t been quilted yet, I will use a Hobbs Heirloom batting. The Wonky Log Cabin pattern calls for 2.5″ strips of fabric to build the blocks. I had quite a few strips from the Vintage Morris collection left over from my Moonflower Cottage quilt, and some smaller scraps from the Northern Woods collection that I used for Guiding Star, but not nearly enough to make the twenty blocks I would need for this project, so I picked up a strip pack from Island Batik’s “Pumpkin Patch” line at my local quilt shop. The background fabric is an off-white from Northern Woods, and the border fabric is from the Pumpkin Patch collection. Making the blocks is a simple matter, really. You begin with a 2.5″ square and add a 2.5″ border around it. Begin with a 2.5″ square, surrouned by a 2.5″ border. Center the square on the Wonky Log Cabin tool on the center square. Trim the right and left edges, using the #1 slots. Rotate the block 90° and light up the cut edges with the blue lines on the tool, centering the square on the ruler on the center square of the block. Again, use the #1 slots to trim the right and left sides. Now you add another round of 2.5″ strips, and repeat the trimming sequence, using the #2 slots. There will always only be one edge that has two seams. When you’re building this particular variation of the Log Cabin block, it’s easy to accidentally add your strip to the wrong edge. One rule I found is that you want to always sew with the seams on top, and be sure you’re sewing across two seams each time you add a strip. There will always be only one edge that has two seams. You will add a total of four rounds of strips to each block. After the final trimming, you will have a perfect 12.5″ Wonky Log Cabin block. The pattern includes instructions for several quilt sizes. I chose to make a lap quilt with 20 blocks, surrounded by a 6.5″ (6″ finished) border, using the traditional “Straight Furrows” setting. My quilt finishes at 60″ x 72″. The “last hurrah” for the 2018 Island Batik Ambassadors is just beginning. You’ll have to wait for the last day to see what I did with my assigned Island Batik collection. If you check the Island Batik Facebook page, you’ll find the full “Getaway” Blog Hop Schedule. The November challenge for the Island Batik Ambassadors was to use a log cabin block as the focus of our designs. If you look through the blog links at the bottom of the page, you’ll be amazed at the creativity displayed by this group. My own quilt began with a fairly grand and highly ambitious design, one my Mother would have loved, because the Log Cabin was her favorite quilt pattern. As it became clear I wouldn’t have it finished by the end of the year, and certainly not by the end of the month, I began to rework the pattern, simplifying the Log Cabin blocks with each revision until it wound up as Moonflower Cottage. The original featured 8″ blocks. Curved Log Cabin blocks surrounded and were surrounded by my own “Morning Glory” blocks. In the end, I enlarged the 8″ blocks to 12″, so there are far fewer blocks required, and the center blocks are merely a nod to the Log Cabin. The fabrics for Moonflower Cottage are from Island Batik‘s “Vintage Morris” collection. They sent me a 42-piece Strip Pack, and two coordinates. I added a peachy orange, and a light green from the same collection for the flower blocks, and one of their off-white basics for the background. The other pieces in the block are three off-white 3.5″ squares, one 3.5″ x 6.5″ rectangle; one 3.5″ yellow square, and one 3.5″ green and off-white half-square triangle. My “Mock Log Cabin” blocks are made with one 2.5″ square, and one each 2.5″ x 4.5″, 2.5″ x 6.5″, 2.5″ x 8.5″, 2.5″ x 10.5″ and 2.5″ x 12.5″ pieces, cut from the strip pack. The background is two 2.5″ squares and two 2.5″ x 4.5″ rectangles. There is also a 6.5″ background square with a blue corner added via the Stitch-and-Flip method. There is also one block that is six 2.5″ x 12.5″ strips sewn into a square. The setting triangles are made with one 6.5″ and two 3.5″ background squares. The blue triangles are made by cutting a 6″ square diagonally twice, and sewing the triangles to the sides of the smaller squares. Note: Traditionally, those blue triangles would be cut from a 5.5″ square. Making my triangles just a little oversize gives me a wider seam allowance on the outside edge, making it less likely that I will nip a white point when adding my binding. Sew into diagonal rows, then sew the rows together to complete your quilt top. My Moonflower Cottage quilt measures about 52″ x 68″, and was quilted by Kathy Brown with Hobbs Heirloom batting and Aurifil thread, both provided by the companies. So that’s how I met the “Cozy Cabins” challenge. 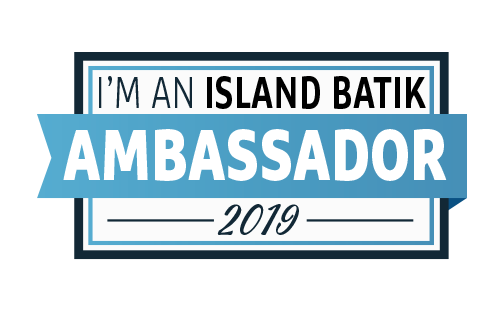 Wait ’til you see what my fellow Island Batik Ambassadors did!